Over the next few weeks, Vulture will speak to the screenwriters behind 2014’s most acclaimed movies about the scenes they found most difficult to crack. Which pivotal sequences underwent the biggest transformations on their way from script to screen? Today Richard Linklater discusses the second-to-last scene from his 12-years-in-the-making epic Boyhood, where Mason (Ellar Coltrane) packs up his things and prepares to head to college, leaving his mother (Patricia Arquette) behind. The scene is then excerpted below. If there was one scene that felt like it was looming over all those years, it was the good-bye scene. 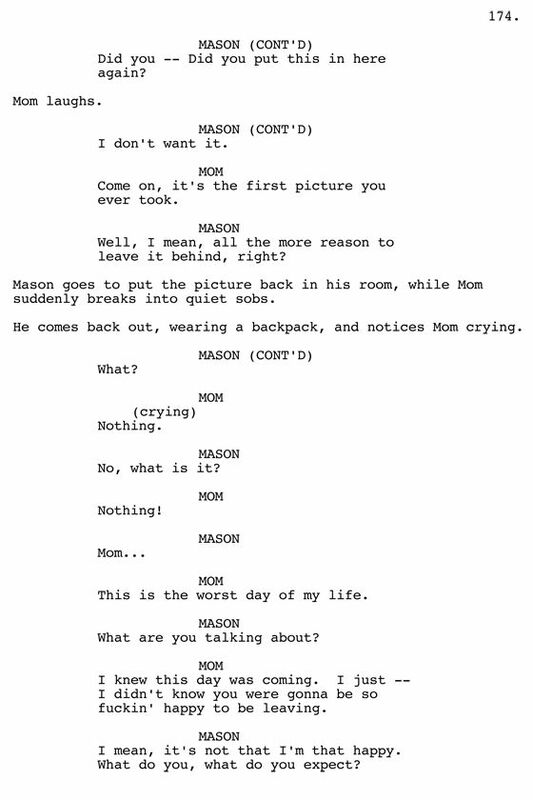 I knew that the last shot of the movie would be Mason at college meeting someone — I had that in my mind for ten years, and I was looking forward to that — but I knew that the scene before it had to be the emotional break of the movie, when son parted from mom. It’s where Boyhood kind of ends emotionally, although spiritually, it continues. So much of this movie was personal, and I had this image in my head for all these years of what my mom looked like when I said good-bye and went to college. She was just sitting there at a table alone, smoking a cigarette and uncharacteristically quiet. I could tell that she was very emotional, but she didn’t say that much. 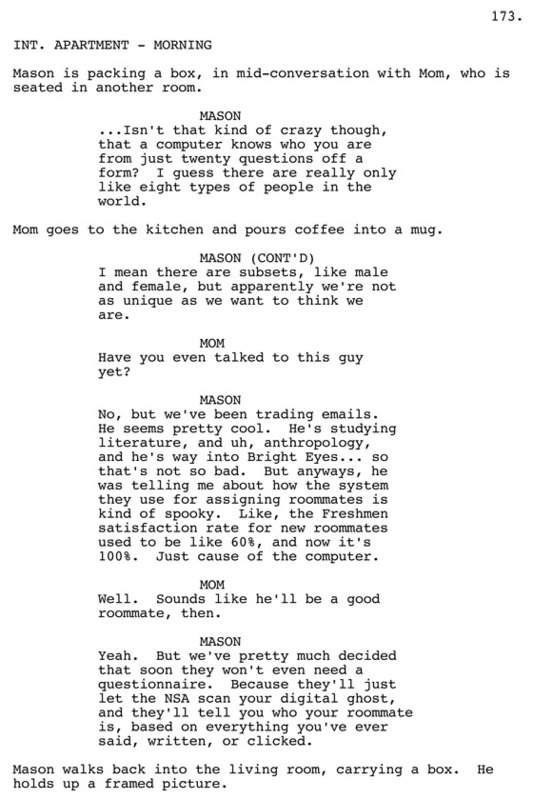 I’d had that image in my head during the 11 years of making this movie, but as we got closer to shooting it, I realized that I needed to flesh it out more with words. People say to me, “Did you have this scripted in advance?” and I say, “No, why would I do that?” We needed to live those 11 years first and experience them, not only in our lives, but let the characters live them, too. As a writer, I’m grabbing lines not just from friends and the world around me, but also from my collaborators on this particular project who know what this moment means. We all brought our personal experiences to it, within the confines of our ever-evolving script. Ethan told me that when he went off to school, his mother said, “I knew this day was coming, but I didn’t know you’d be so damn happy about it.” Parenting can be kind of a one-way street — you get so much, but what you give is not necessarily reciprocated.